Girl #3 didn’t get any new gear, but she got some handmade by mommy stuff, which neither of the other girls received. It’s just because she’s my favorite. First up, a carseat cover, since the original one was so grody at this point that you couldn’t tell what color it was supposed to be. In a very un-Adrianna-like move, I actually used a tutorial to make this. Usually I spend days and weeks reinventing the wheel, tearing my hair out, and generally subjecting my family to whining and grumpiness when I can’t figure something out. This time, I did a quick google search and found a perfectly documented procedural from Ashley at Make it and Love it. 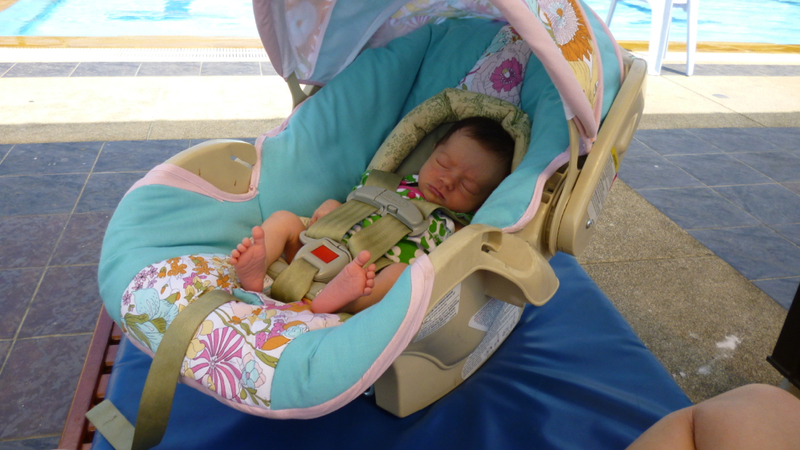 My carseat was shaped slightly differently, but the tutorial worked great anyway. I recommend it, for those of you who are smart enough to seek help without needless tears and gnashing of teeth first. My favorite part is the shade. I love how professional everything looks with just a little bit of piping. (note to self: use piping more often.) This isn’t actually piping, but the casing that holds the plastic arc. Same diff. The more observant readers may recognize this fabric as a Liberty print, and you’d be right. When Liberty did their line for Target, I bought this flat sheet just to use for the fabric. I thought this was the perfect project to show it off. The light teal is a linen/cotton blend. Baby girl isn’t talking in full sentences yet, but you can just tell from the smug look on her face and her calm demeanor whenever we strap her in that she knows she’s the only baby rocking a custom Liberty seat. And, of course, the seat looks even better with a baby in it. Yeah, it’s 88 degrees F here, and we’re at the pool. Don’t hate. 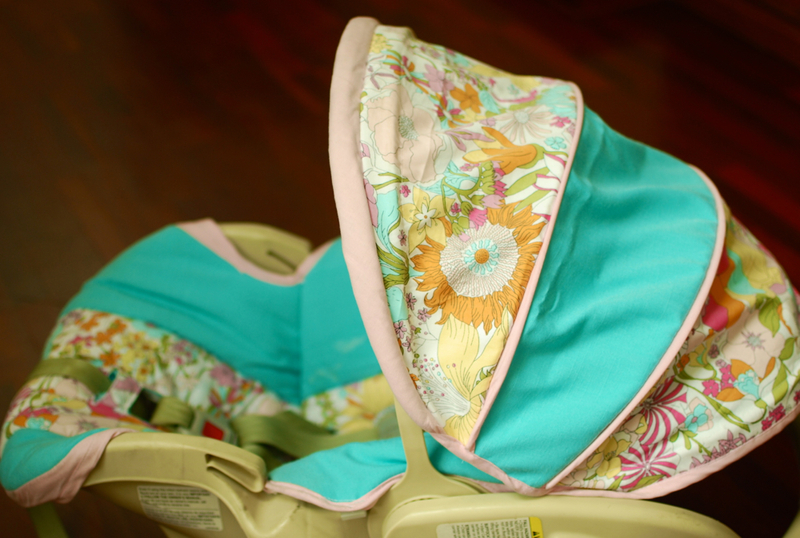 If you are thinking of redoing your carseat cover, I say go for it! It took some time, but was generally much easier than I expected. Just take lots of pictures before you tear apart the old cover, and I would strongly recommend store-bought bias tape. The only imperfections on mine are because of my wonky hand-made tape. It just wouldn’t wrap all the way around the bulk of some of those 4 layer seam allowances. You crack me up. The new cover is beautiful. I love that you used the liberty print! Nicely done, there are advantages to using patterns sometimes (Jennifer would say “all the time”) ha ha. It was 82 here yesterday. We started out at 50…. Wow that is really pretty. And i hate to ask this but do you know that carseats expire? I don’t know how old your seat is but on the back of your seat it should say don’t use after “insert date”. Also if you were to get in an accident your handmade cover could cause the seat to not work properly. You are never supposed to use “aftermarket” products with the seat. Congratulations on your new little one! Actually a handmade cover will not affect how the seat works. It does two things: one, void the warranty. two, it may not be fireproof. Wow! I am so amazed. I have no idea how to sew, so if I did I bet I’d be even more impressed. I LOVE the fabric choice! I love this so much! Great job. Cute munchkin! OMG, at first I thought this might be a Susan post and I couldn’t figure out how I missed that baby #3 was on the way. I love it! Really super super super cute. I will put this on the to-do list for Baby No.2 one day. What a pretty cover! I love the look with the solid section in breaking things up. Swanky, swanky! Looks gorgeous!! Love that liberty print and that baby. :) Wish we were at the pool. Love. Baby and seat cover. In that order. Cute carseat cover! 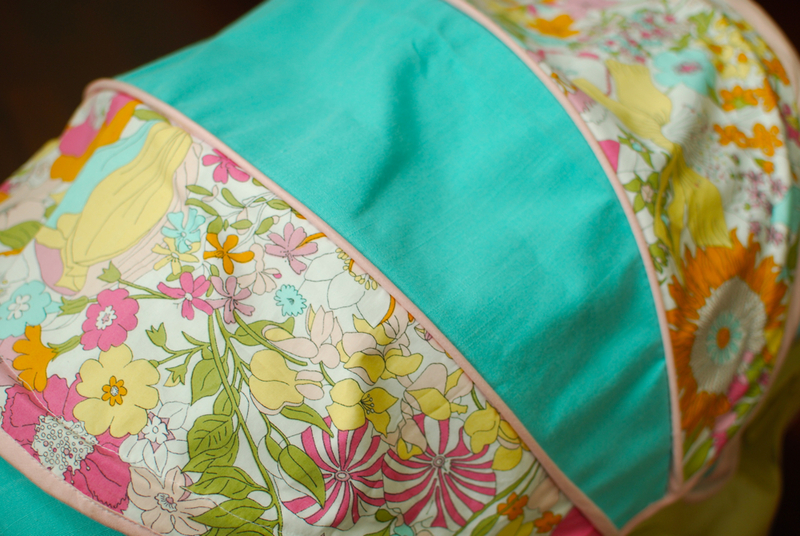 Where did you find the floral liberty print fabric? I’ve googled it and can’t seem to track it down. Thanks for your help!